Be the first to review this 2019 Chevrolet Traverse. The 2019 Chevrolet Traverse mid-size three-row crossover SUV focuses firmly on family tasks and travels. 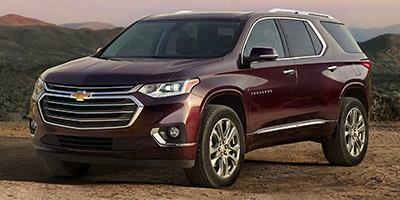 Seating up to eight, the Traverse debuted for 2009, and shifted to a boldly-styled second generation for the 2018 model year. The current model is indebted to Chevrolet’s truck division for much of its appearance. Not much has changed for the 2019 model year. A new LT Premium package, standard on RS and available for LT Leather trim, includes a surround-view camera system, a camera-based rearview mirror, 20-inch alloy wheels, an 8-inch touchscreen for navigation and audio, Bose speakers, and a 110-volt outlet. A heated steering wheel is newly standard on Premier and High Country models. Chevrolet has added an all-wheel-drive RS model with V-6 power. A turbo-4 version remains available, only with front-drive. As before, L, LS, LT (Cloth or Leather), RS, Premier, and High Country trim levels are offered. Stout and sturdy, Chevolet’s 3.6-liter V-6 develops 310 horsepower and 266 pound-feet of torque. A smooth-shifting 9-speed automatic is the sole transmission, but it ranks among the better units. Front-wheel drive is standard. Part-time all-wheel drive is available for LS, LT, and Premier trim levels. A twin-clutch AWD system, with automatic-locking rear differential, is standard on High Country models. Safety technology is costly, and largely limited to top trim levels. The Insurance Institute for Highway Safety has not crash-tested a Traverse in its current form. Standard equipment includes what’s expected on family-focused crossovers, but not much more. All models include a rearview camera. Available on top Premier versions and standard on the High Country are automatic emergency braking, active lane control, adaptive cruise control, and automatic high beams. Outward vision is good for such a large crossover. Parking sensors would be prudent for maneuvering into tight spots. Though handsome enough, cabins emphasize durability over design. Top trim levels may be trimmed in leather, but the Traverse trails Buick’s Enclave for premium looks and features. Several appearance packages are available for LT models. So is a comfort/convenience option group that upgrades to an 8.0-inch display screen, adding heated front seats, a power liftgate, blind-spot monitoring, and rear parking sensors.